Like a succession of failed diet regimens, the much-touted techniques that are supposed to bring us closer to God "in our hearts" can instead make us feel anxious, frustrated, and overwhelmed. How can we meet and know God with ongoing joy rather than experiencing the Christian life as a series of guilt-inducing disappointments? Phillip Cary explains that knowing God is a gradual, long-term process that comes through the Bible experienced in Christian community, not a to-do list designed to help us live the Christian life "right." This clearly written book covers ten things Christians don't have to do to be close to God, such as hear God's voice in their hearts, find God's will for their lives, and believe their intuitions are the Holy Spirit. Cary skillfully unpacks the riches of traditional Christian spirituality, bringing the real good news to Christians of all ages. 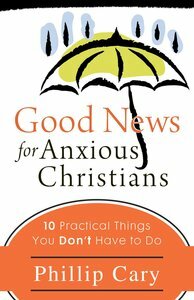 About "Good News For Anxious Christians"
Phillip Cary (Ph.D., Yale University) is professor of philosophy and director of the philosophy program at Eastern University in Pennsylvania as well as scholar-in-residence at the Templeton Honors College. He is the author of Jonah (Brazos Theological Commentary on the Bible) and of three critically acclaimed books on the life and thought of St. Augustine - Augustine's Invention of the Inner Self (Oxford, 2000); Inner Grace: Augustine in the Traditions of Plato and Paul (Oxford, 2008); Outward Signs: The Powerlessness of External Things in Augustine's Thought (Oxford, 2008), and most recently the popular title Good News for Anxious Christians: Ten Practical Things You Don't Have to Do (Brazos, 2010).